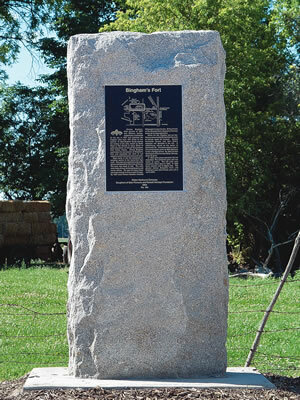 Monument dedicated for Bingham Fort of Ogden on Aug. 6. Residents of Ogden's West 2nd Street have a new reminder of their neighborhood's notable history. A six-foot granite monument with plaque now graces the southern sidewalk of the street at approximately 325 West, memorializing Bingham's Fort, a pioneer fort built on this site in 1853 and named after Erastus Bingham. Perpendicular to the monument, a stone crosswalk spans West Second Street, marking where the western wall of the fort used to be. The Bingham's Fort site, now a privately-owned farm, is the oldest pioneer site in Weber County. It is listed on the National Register of Historic Places. On Aug. 6, neighbors, historians and descendants of Erastus Bingham gathered to dedicate the monument. Mary Johnson, president of International Society-Daughters of Utah Pioneers, and Rick Safsten, Ogden City Council Chair, spoke at the dedication. David Stone Montgomery, whose farm is adjacent to the monument site, offered a prayer thanking God for the pioneers who contributed to making the area "blossom like a rose," and for their legacy of citizenship. A great-great-great-grandson of Erastus Bingham offered the dedicatory prayer. Brent Bingham expressed appreciation for the "lives, commitment, values and service" of the pioneers, specifically Erastus Bingham and his wife, Lucinda G. Bingham. Brent Bingham hopes the monument will be an "inspiration to those who pass by." 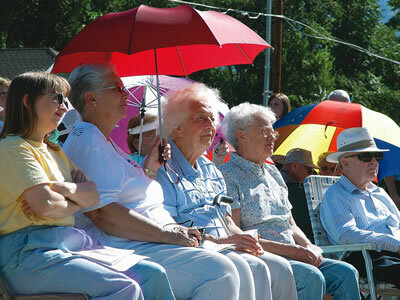 Neighbors and descendants of Erastus Bingham attend the dedication of the Bingham Fort monument. Indeed, the monument is a reminder of the work done and sacrifices made by the residents of the 45-acre fort. In addition to constructing the fort walls with rock, poles, willows and mud, residents extended the irrigation ditch (which is still in use today), erected homes, raised livestock and tried to live peaceably with the Native Americans. They built a mercantile, schoolhouse, saw mill and molasses mill for sustenance and community needs. All this was done at the direction of Brigham Young and Bishop Bingham. Erastus Bingham was an ecclesiastical and community leader, serving as bishop in 1851, Selectman for Ogden City from 1852-1855 and from 1856-1860, and Associate Justice in Ogden City in 1851. Bingham Copper Mine, Bingham Canyon and Bingham Highway are all named for him. Erastus and Lucinda Bingham have more than 30,000 living descendants. Pamela Carlene Nelson was key in organizing the memorial project. Nelson is a member of Friends of Bingham's Fort, a great-great-great-granddaughter of Erastus Bingham and a historian. For her, the monument is one way to preserve her heritage and to understand who her ancestors were. The history of the fort is not about dates but about people and family. David Montgomery was also instrumental in bringing the monument to West 2nd Street, contributing his own resources of time, money and historical documents. "The past is being torn down and forgotten," Montgomery said. "We need to preserve the past so we can better appreciate what we have today." Many other people and organizations contributed time, money and talents to the project, notably Nelson Intermountain Crane and Busenbark Construction. These companies undertook the arduous task of relocating the granite slab from its previous location at Ogden's Five Points to West 2nd Street. The monument was originally placed at Five Points in 1951 by Daughters of Utah Pioneers but was relocated to West 2nd Street in 2004 because the widened road brought the curb close to the monument and the new sidewalk ran behind the monument, making it difficult to read. The slab received its new plaque in 2005, with the old plaque remaining on the back side where it may still be seen. The Bingham Fort Memorial is sponsored by Friends of Bingham's Fort, Daughters of Utah Pioneers and Our Families Roots Organization. Future projects for the area include a monument to the "Indian Tree" and returning Erastus Bingham's cabin, currently in Lagoon's Pioneer Village, to its original location. Steve Johnson, president of the non-profit Our Families Roots Organization, filmed the dedication and will include it in a documentary about Bingham's Fort. Johnson encouraged everyone interested in learning more about these projects or the history of the area to contact him at 721-6505.